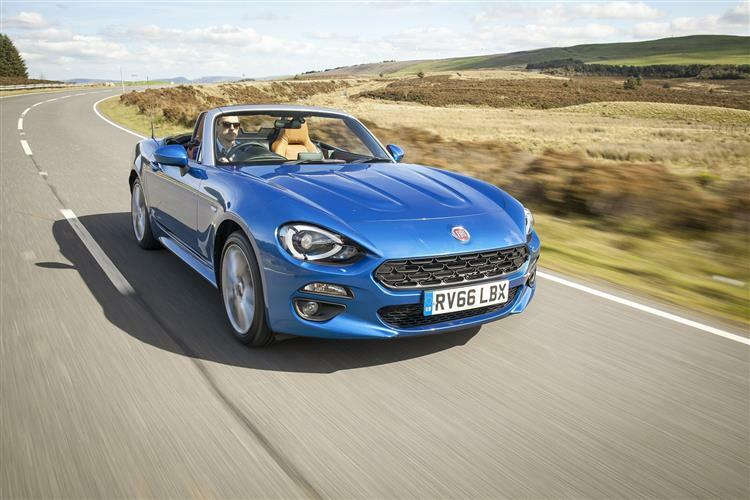 Fiat borrows a familiar name for its latest affordable open-top model - and it runs on familiar underpinnings too. 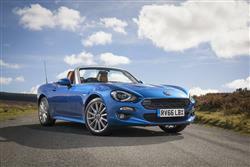 Jonathan Crouch looks at the brand's appealing little 124 Spider. It's been over ten years since Fiat brought us an open-topped roadster - the much-loved Barchetta. That was based on front-driven Punto architecture and sold only in limited numbers. 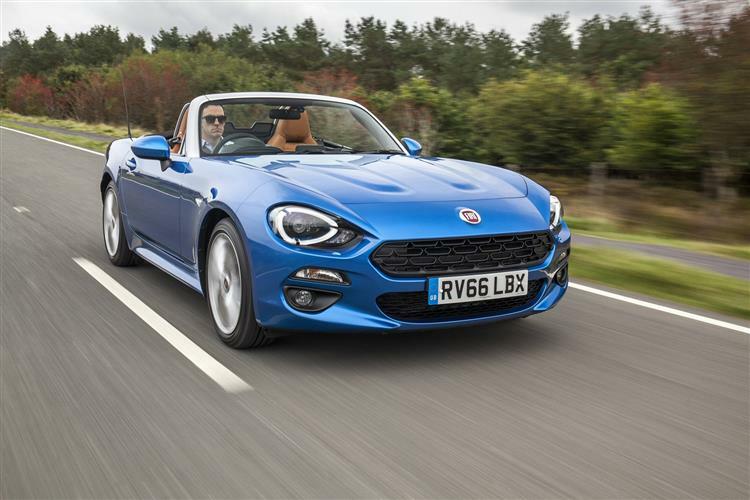 This 124 Spider though, looks to have much more than that to offer, its name referencing the Pininfarina-designed 124 Sport Spider of the 1960s. 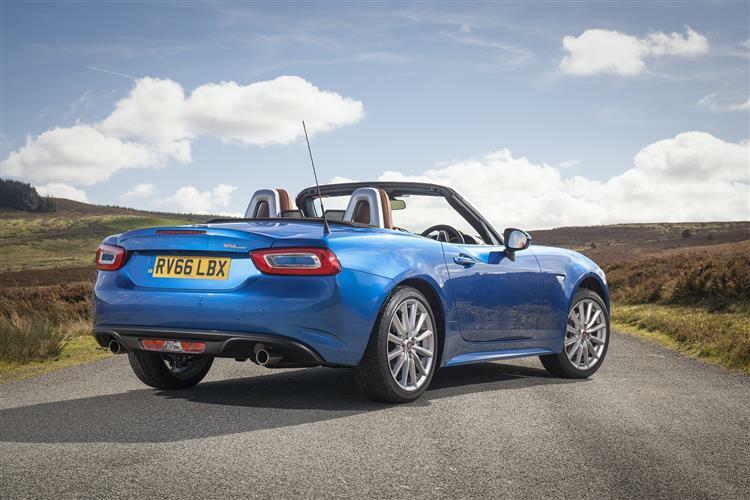 This modern model borrows its underpinnings from the best affordable roadster on the market, Mazda's MX-5, though Fiat has decided to fit its own 1.4-litre MultiAir turbo engine beneath the bonnet to replace the 1.5 and 2.0-litre normally aspirated units used by Mazda. The idea is to bring the authentic, Italian roadster driving experience to a whole new generation of British enthusiasts. The design of this 124 Spider may borrow much from Mazda's rival MX-5, but what lies beneath the distinctive bonnet is all Fiat's own. Here, you'll find the brand's proven 1.4-litre MultiAir, turbo-charged four-cylinder petrol engine which delivers 140bhp and 240Nm of torque to the rear wheels via six-speed manual transmission and a compact rear differential. This unit is capable of accelerating to 62mph in 7.5 seconds and has a top speed of 134mph. If that's not enough, there's a pricey Abarth variant with a 170bhp version of this same engine and a limited slip differential to better get torque to the tarmac. The 124 Spider's suspension uses a double-wishbone layout in front and a multilink set-up in the rear, specifically tuned for greater stability while braking and turning, while the dual-pinion electric power steering system has been specifically tuned to give the Spider a responsive, Italian feel. We've yet to drive the car but it should indeed feel different from its MX-5 rival, if only because Mazda declines to use turbocharged power beneath the bonnet. 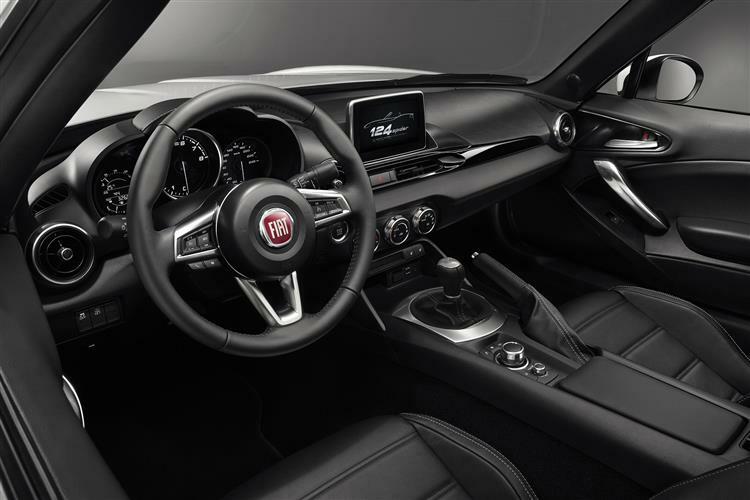 Designed in the FIAT Style Centre, the front-end of the 124 Spider aims to encapsulate the essence of its classic predecessor in a modern and bold package. 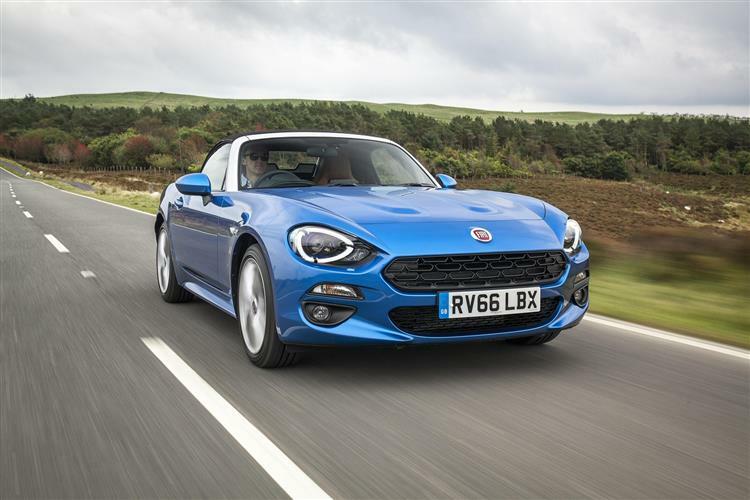 Under the skin, the underpinnings may be borrowed from Mazda's MX-5 (the fabric hood is too) but the Italian brand has done much to give this model its own identity. The profile view is pure classic roadster, with its long wheelbase, a cockpit hunkered low near the driven rear axle and a long bonnet, all tied elegantly together by a horizontal line that emerges from the front wing, kicking up over the rear haunch and flowing toward the tail lamp, aping the distinctive bodywork of the original 124 Spider. The nose of today's version also takes its inspiration from the 1966 original, with the style and position of the LED headlamps and the hexagonal upper grille all drawing heavily from the details of the classic roadster. The bonnet of this car also emulates the twin power domes of its predecessor, while the rear view is defined by two main features: the swallow-tail rear wings, the upper surface of which cascade inward toward the decklid: and the sharp horizontal tail lamps with their distinctive ring shape. An integrated rear spoiler enhances aerodynamic performance, while twin exhaust outlets are a reminder of this car's sporting pedigree. Pricing starts at around £21,000 (around £1,000 more than an MX-5) and three trim levels will be offered in the UK: Classica, Lusso and Lusso Plus. On top of that, there's a 170bhp Abarth version, but that will cost around £30,000. Standard equipment on the entry-level Classica variant includes four airbags, air conditioning, a leather-trimmed steering wheel with audio controls, a leather-trimmed gear knob, cruise control with a speed limiter, 16-inch alloy wheels, keyless engine start and a powerful infotainment system with USB, AUX and Bluetooth connectivity. 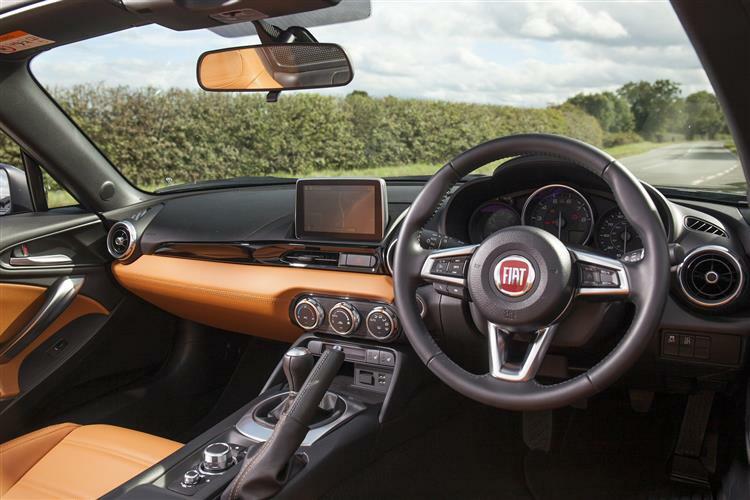 A seven-inch touchscreen infotainment system with DAB, WiFi, two USB ports and a multimedia control knob is available as a £500 option. The mid-range Lusso version is equipped with that seven-inch infotainment system as standard, but adds satellite navigation with 3D maps and the Parkview rear parking camera as well. It is also equipped with 17-inch alloy wheels, heated leather upholstery, automatic climate control, front fog lamps, keyless entry, chrome exhaust tips and a premium silver finish on the windscreen frame and rollover bars. The top Lusso Plus model builds on the specification of the Lusso model by adding adaptive LED headlamps, automatic lights and wipers and a nine-speaker BOSE sound system (including stereo headrest speakers on both seats). Running cost efficiency won't be too high on your list of priorities for buying a roadster, but you'll need to know that costs have been kept in check. 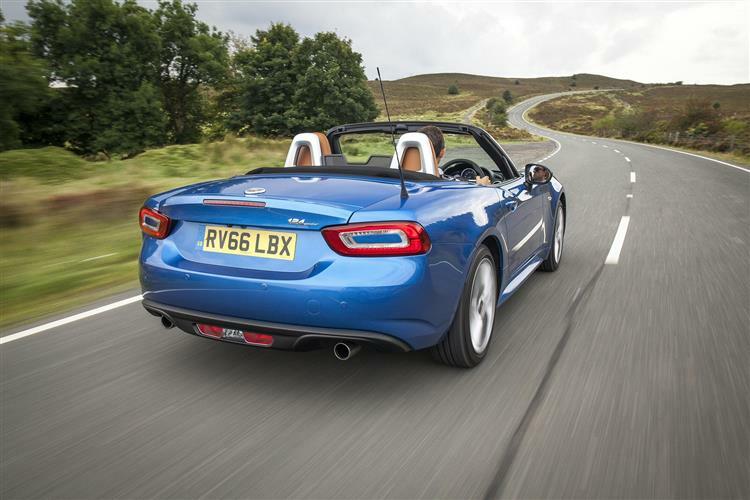 This 1.4-litre turbocharged 124 Spider manages 44.1mpg on the combined cycle and 148g/km of CO2. 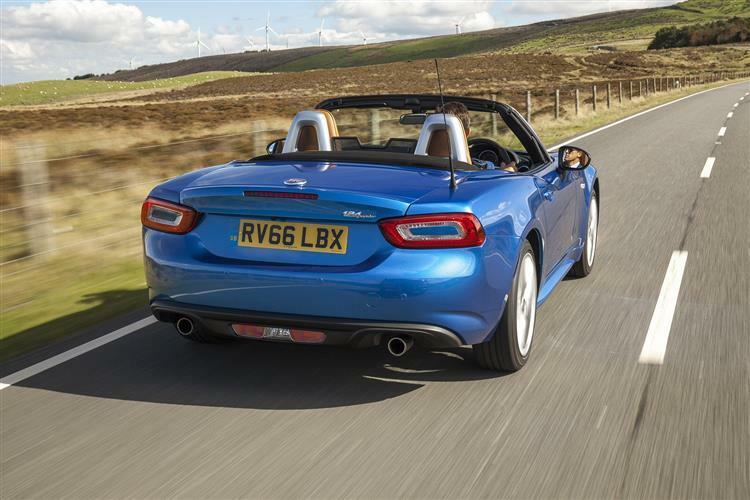 For reference, the figures for a directly comparable 1.5-litre normally aspirated Mazda MX-5 are 47.1mpg and 139g/km. What else? Well there's a three-year unlimited mileage warranty, which is slightly better than the class norm. Residual values will be strong and maintenance costs should be as affordable as they usually are for Fiat models. Plus you can organise servicing visits more easily by taking advantage of the 'my:Car service' feature that's been built into the 'Uconnect LIVE' aspect of this car's infotainment system. This gives you an interactive vehicle handbook and real time servicing reminders that can be set to work with a 'Uconnect LIVE' account you can set up on your smartphone. 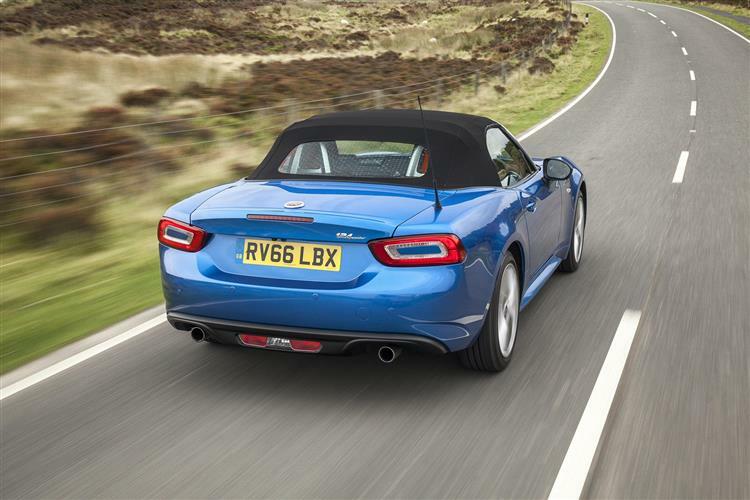 There's a lot to like about the 124 Spider. You would expect that. After all, you can't go too far wrong if you base a product on a market-leading alternative, in this case Mazda's MX-5. Given that, Fiat has done a good job here to give its derivation of this design its own distinctive appeal. A lot of UK enthusiasts have been long waiting for an affordable Italian roadster of this sort and they won't be disappointed with what's been delivered here. Are there issues? Well, we're not sure that the turbocharged 1.4-litre Fiat engine used is quite as characterful as the normally aspirated powerplants that Mazda uses: it's certainly not as efficient. That apart though, we'd recommend you try this Latin contender if you're in the market for an affordable roadster. It's a welcome addition to the brand's line-up.